It’s easy to forget that Samsung isn’t just about high-end QLED TVs. Indeed, its most popular offerings are regulation LED LCD models - and they don’t come more mainstream than this polished mid-ranger. If you’re hankering after a better than budget screen from the brand, but can’t quite spring to a flagship model, then this 7 Series model still manages to offer impactful HDR with a minimalist, smart design. You’d never guess this is a sub £1000 set from its design. It’s impressively slim, with a high gloss black bezel and silver trim. The back panel is similarly uncluttered. Inputs include four 4K ready HDMIs, so there’s plenty of room for your 4K sources, and a trio of USBs. The MU7000 line is positioned just above Samsung’s various 6-Series models, and as well as the 55-incher here, comes in 49-inch, 65-inch, and 75-inch screen sizes. You want their full titles? Well, they are… Samsung UE49MU7000, Samsung UE65MU7000, Samsung UE75MU7000. The MU7000 is as at home with HD as it is with 4K UHD sources. Images appear sharp, and nuanced. Colour vibrancy is impressive, and there’s a high level of contrast, courtesy of Samsung’s local dimming. The set optimistically lays claim to extremely bright HDR, up to 1000 nits for small spectral highlights, although measurable HDR performance is probably going to be significantly less. Even so, this is glary enough to make the most of HDR10 and HLG. There’s no Dolby Vision or HDR10+ support. Although edge lit, UHD Dimming enhances contrast by independently adjusting tone and brightness based on content. 4K fine detail is easily discernible, provided you don’t sit too far back. The golden rule of 4K is view nearer than you would an HD screen of the same size, or leave your sofa where it is and buy bigger. Image depth is fine, although don’t come to this mid-ranger expecting OLED-style blacks. Dynamic Crystal Colour technology keeps images on the right side of ripe, while Precision Black image processing is used to improve shadow detail. The set uses assorted upscaling techniques to make the most of standard HD SDR sources. Its HDR+ dynamic range upscaler lifts SDR content by ramping up brightness and colour. We’ve seen some superb, and surprisingly subtle, SDR-to-HDR image processing in the wild (Sony’s object-based remastering is probably the best), but Samsung’s approach is a little more blunt force. It’s worth trying though, particularly if you want maximum picture whammy for your cash. Be warned: HDR+ may create artefacts and exaggerate noise though. Sports fans will appreciate Samsung’s Supreme Motion processing technology, which effectively reduces image blur and judder. Try not to use this interpolation for movies or cinematic TV shows though, as it adds a shiny looking soap opera sheen, which makes everything look like a daytime soap. As this isn't an IPS panel (as favoured by LG), there’s a limit to how far you can sit off angle before colour intensity and contrast fade. Finally, given that you can’t actually spot any speakers on the MU7000, it’s probably remarkable that the MU7000 sounds as good as it does. It’s still worth planning a soundbar upgrade, though. At the heart of this set is Samsung’s second generation Eden smart TV platform, which takes an intuitive approach to menu navigation, and allows a welcome level of customisation based on what sources and services you want swift access to. A Quad Core processor puts a spring into menu navigation. OTT apps include Netflix and Amazon Prime Video, both with 4K and HDR capability, plus all the main catch-up TV services. However, this Samsung model doesn’t feature Freeview Play, so no natty roll-back EPG or integrated IP channels, which is disappointing. On the plus side, Samsung’s own TV Plus VOD film service promises to keep you amused, should you fancy an impromptu movie night. There’s even voice navigation, via S Voice on the remote control, which allows limited control via simple spoken commands. But with Amazon Alexa and Google Assistant fast becoming the talk of the town, a secondary chat interface seems a bit redundant. The supplied remote also offers a level of universal control, if you find that more intuitive than simply using different doofers (we don’t). Currently selling for well under a grand (the 65-incher is only just over £1000), the MU7000 is a cracking mid-range 4K UHD option. 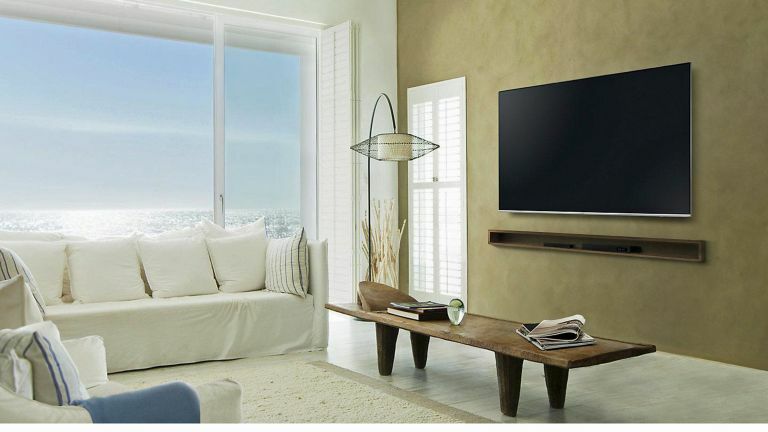 It’s up against stiff competition from the likes of Panasonic, Hisense, Sony and Philips, but the build quality, design and performance in bright rooms make it a very attractive option. We rate the UE55MU7000 as a great mid-range buy, particularly for bright room viewing. It combines bright HDR imagery with a crisp aesthetic design. Throw in a fair amount of streaming service support, and you’ve got a Samsung set that more than delivers on its price promise.